Recently, I found out that Hidden Garden had been nominated for the 2007 Hot List on MyFoxLA.com. I was thrilled to be nominated, and I am even more excited to announce that we won! Sometimes wedding color combinations that you wouldn't traditionally pair together turn out to be a creative and interesting masterpiece. 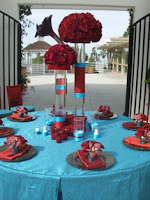 Recently, we had a bride that requested her wedding colors to fit into the realm of turquoise blue and deep red. At first, you would think this would be a less desirable wedding color combo; however, it turned out to be eye catching, unique, and visually appealing. Just by adding a few details, many color combinations may turn out to be much more intriguing and much less traditional, which many strive to create. Notice in the pictures the attention to details that make all the difference: fabric & ribbon treatment on the glass, specialty votive treatments & glass color, napkin accents, container color, and linen/napkin colors. When you get your beautiful floral arrangement delivered to you from a florist you are always so excited and hope it lasts forever! 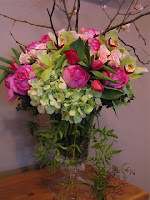 Unfortunately, it doesn't but there are ways to extend the life of your flower arrangement with proper care. 1. Always make sure the flower vase is filled to the top with fresh water. Flowers need water (just like we need air!). Sometimes when flowers are delivered they loose a bit of water in the transportation so always top it off. 2. By the 2nd or 3rd day flush the old water out of the flower vase and refill it with a clean batch of water. This will help remove any of the bacteria that started to accumulate in the vase. 3. You could also trim the bottom of all the flower stems (depending on how the arrangement was designed you may or may not be able to do this) and put them back into a fresh vase of water. 5. 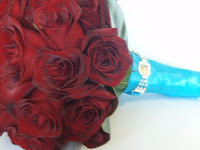 As your arrangement ages, pull out any dead flowers or petals from the arrangement. This will also help the flower arrangement look better too. Thanksgiving is a time for family and friends to gather together and enjoy a festive meal to show our love and gratitude for each other. 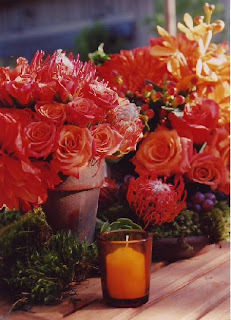 Here at The Hidden Garden we pride ourselves in helping our clients create a beautiful Thanksgiving with seasonal fall accents, color tones to compliment your home, and special floral touches to give your holiday a truly warm feeling. Wishing you a Thanksgiving Day filled with love, gratitude, and a beautiful holiday table! 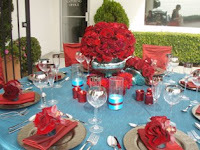 Clients always want to know "Do you always have fresh flowers in your house"? I do!!! I love having fresh flowers in my home. Even though we design these beautiful floral arrangements for clients all the time I actually like to keep things a little more simple in my own home. I tend to use one type of flower in a vase - in abundance! It might be 10 stems of hot pink hydrangea flowers on my center kitchen island and then a bouquet of all tulips on the dining table. Just to bring the traditional Hidden Garden look at home I usually place one "arranged" group of flowers from our designers, here at the studio, in the niche of my entry. I always like seeing a beautifully arranged floral too! I guess my point is, you don't have to just have "professionally" arranged flowers around your house all the time. Sometimes the simple grouping of one flower is just so beautiful! It makes your "house" smile! As a wedding consultant it’s always a treat to work with a bride and groom who break from tradition and plan something totally unique for their big day. It’s especially nice when their individuality also helps the environment and raises awareness for eco-friendly alternatives. 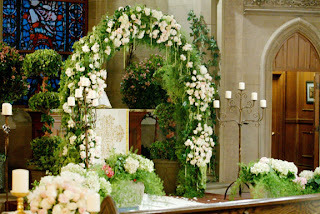 Earlier this year, I was asked to design an eco-friendly wedding for NBC’s popular daytime drama, Days of Our Lives (Sami and Lucas’ “green” wedding.) Although I am not a soap junkie, I certainly knew the show and how popular it was, so I was very excited and a little nervous. To create Sami’s flowers, I used locally grown and environmentally-friendly flowers including tons of California roses and an assortment of potted, flowering plants. By using locally grown flowers, you cut down on the pollution created during transport, along with the pesticides used to treat the flowers. In keeping with the eco-friendly theme, the potted plants used in the ceremony were used again during the reception hall (you can transfer your ceremony plants and flowers to your reception hall) and all were immediately planted afterwards. This is not only eco-friendly but cost-effective and what a great message to send to your guests! The “Green” episode on Days of Our Lives aired in April 2007 and I was there bright and early (and 7 months pregnant) but it was a blast. I had never been on a soap set, it was very cool and extremely efficient. I think they do like a million shows in one day. Days of Our Lives also incorporated the “green” theme in the lead characters Samantha “Sami” Brady (Alison Sweeney) and Lucas Roberts’ (Bryan Dattilo) nuptials. I do believe I’ve seen that the two newlyweds are already nearing divorce though. That’s daytime drama for you. 1. Go with locally grown flowers that save on pollution from transportation and pesticides, which growers use to preserve the flowers’ freshness. 2. Make a trip to your local florist and rent glass flower vases that can later be returned and recycled; plus it’s more cost effective than purchasing. 3. Rather than sprinkling the aisle with real rose petals, opt for fake rose petals, which these days look realistic; plus they won’t stain the carpet. Read my article on Going Green in the current issue of Inside Weddings on stands until December. 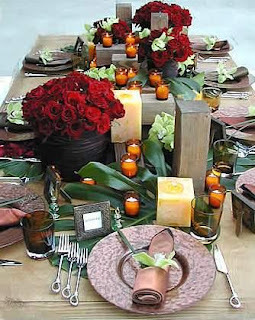 For your Thanksgiving table bring in fresh leaves, gords and mini pumpkins and intermix them down the center of your table. Add a few candles in between the items too. If you want to include fresh cut flowers, tuck small floral vases in between the elements to add an extra “pop” to the table. This also works nicely for retail store countertops. Another fun idea that doubles as a family project, is to carve out the center of fresh pumpkins and insert small glass bowls, then you make your fall arrangement inside the pumpkin! Use different sizes, shapes and colors of pumpkins all over the house. The Hidden Garden has been nominated as the top wedding floral studio in Los Angeles - I'm so excited! Who am I? Why am I here blogging? I love flowers. I love sending them, receiving them, smelling flowers, growing flowers and buying flowers. Several years back I decided to take a nighttime course on flower arranging and it turned out I was pretty good. Now I own and operate the Hidden Garden Floral Studio in Los Angeles and I get to design beautiful flowers and brighten peoples’ lives for a living. Wow, I still can hardly believe it! I am going to do my best to blog here as often as I can just to share thoughts and ideas and maybe some really cool events and weddings that we’ve been working on. I look forward to receiving commen ts and questions. I don’t claim to be the authority on all things floral, but I certainly love designing them and am willing to share my experience. It’s an amazing gift to be able to make a living doing what you love. If my experience encourages someone else to follow their dream, then I guess this blogging thing really is as cool as they say.